The idea of training your cat to come when you call her may seem ridiculous — after all, cats are independent beings who do whatever they please. But while your repeated coos of “Here, kitty kitty!” may produce only an unreliable response from your feline, it’s likely that other cues, such as the sound of a can of cat food popping open, consistently cause her to come running. Training your cat to come when called is simply a matter of making “Here, kitty kitty!” just as appealing to her as the sound of the can opener. The key is to build the training around positive associations. A consistent cue (“Kitty, come!”) paired with a pleasurable reward makes the cue worth responding to. 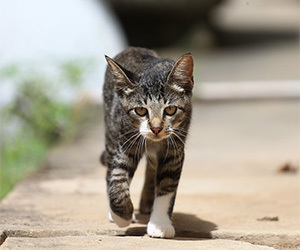 There are a number of ways to teach a feline to come when called, but the simplest is to pair the cue with something that already brings your cat running to you. Start by determining which stimuli your cat already responds to — a few common options are the rustling of a treat or food bag, the whir of the can opener, the clink of a food bowl touching the floor or the sound of the refrigerator opening. You’re looking for events that consistently cause your kitty to come running to you. The first step is to teach your cat to associate the new verbal cue with the existing stimulus. Give the cue just before engaging in a behavior that already draws your cat’s attention — for example, say “Kitty, come!” just before you open the treat drawer. Once your kitty arrives, follow up with a reward, like a treat. The reward doesn’t have to be food based — for playful kitties, the call may be followed by a play session with a favorite toy. Once your cat starts responding to the verbal cue, the original stimulus — shaking the treat bag or turning on the can opener — can be faded out. With repetition, your cat will learn that the “come” cue on its own signifies that something good — a treat or playtime or petting — is sure to happen when she finds you. When your cat masters the “come” cue, you can start to work with her on responding to it in all areas of your home, not just in one area, like the kitchen. To teach this, start slowly — move from the kitchen, for example, to an adjacent area like the dining room. Reinforce the cue in other areas of the house by pairing it with some of your cat’s favorite activities: Give the “Come, kitty!” cue just before you toss her favorite catnip mouse toy or immediately prior to sitting down on the sofa or just before delivering her meals. Keep in mind as well that while your cat will learn to respond to behaviors that result in something good, she will also learn to avoid behaviors that cause something unpleasant to happen. For instance, if your cat doesn’t relish being held or touched, responding to her approach by reaching out to pet or pick her up will dissuade her from coming when she’s called. Avoid doing anything the cat seems to consider negative, such as placing her in her crate or trimming her nails, immediately after calling her. In these situations, it’s better to go and find your cat rather than calling her to you. Another approach is to use the 10-to-1 rule: For every 10 times you call your cat, only one of those times, at the most, should result in anything even remotely unpleasant happening. The rest of the time, call your cat, reward her and then allow her to go about her business.